One day, not too long ago, I was minding my own business as I surfed the web looking at food when I was stopped dead in my tracks. What did that just say? Pistachio and gorgonzola risotto ? I have done gorgonzola risottos before so I know how good they can be, but I never would have thought to add pistachios and they just happen to be my favorite nut at the moment. This pistachio and gorgonzola risotto is pretty much a standard risotto where the more regular cheese, the parmigiano reggiano is replaced with gorgonzola dolce, a soft blue cheese, and of course some pistachios are added. Other than taking a bit of time to make, as all risottos do, this one was pretty easy and it turned out great! The risotto was so nice and creamy with the blue cheese adding a pleasant mellow tanginess and the flavour complimented the pistachios fantastically. The pistachios also added a nice contrast in texture and toasting the pistachios ahead of time aided their crunchiness. You could serve this amazing risotto as a side dish or as I did this time, as a light meal. 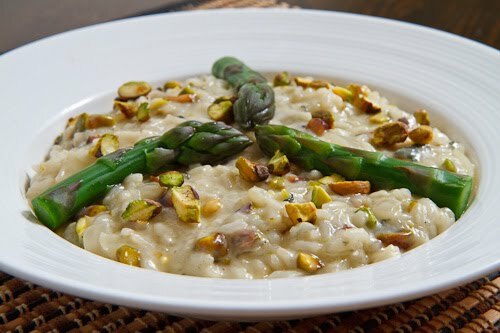 With asparagus in season I could not help but serve some, simply steamed, with the risottos and it was the perfect combination with the juicy asparagus refreshing your palate after each bite of the rich and creamy risotto. Heat butter in large sauce pan. Add the rice and stir to coat with the butter. Add the wine, deglaze the pan and stir while simmering until it is gone. Add 1/2 cup of the stock at a time and stir while simmering until it is gone. Continue until the rice is al dente. Add the gorgonzola and butter and stir until melted. Add the pistachios and serve. I just figured out how to make risotto, so I'm excited to try this variation! Gorgonzola is usually a bit too strong for me, but I bet it's mellowed out in the risotto. Looks and sounds really good. I love the way you write, too, its so entertaining and you make it sound so interesting and fun. congrats for all. you must be an amazing cook. This looks wonderful! I bet the textures are really amazing – creamy risotto, crunchy nuts. Awesome! This sounds so incredibly delicious Kevin! I wouldn't have thought to put gorgonzola and pistachio together either…but now I'm definitely going to have to try that flavor combo! I always forget to do the nutty thing with my risotto. I think I might try this but fully grind the pistachios and make a kind of super reduced romesco sauce for the risotto. this is quite the interesting combo. i am betting it tastes DIVINE!!! What a beautiful combination of flavours perfect for a risotto… sounds so very good! what a wonderful combination…i can already taste it. this will wake up your taste buds. Oooh, I have got say that looks fantastic! Great dish! Wow… never would have thought to combine pistachios and gorgonzola, but now that you mention it… Mmm! I'll have to try this… thanks!